Owning a hanging toiletry bag is an absolute must if you are a frequent traveler. By simply throwing your toiletries into your bag you are not only running the risk of not being able to access what you need, when you need it, but you will also find it difficult to organise all of your toiletries. With a high quality wash bag, you are able to keep all of your grooming essentials neatly into one place so that you can access them whenever you need to in order to make sure that you look and smell your best at all times. Whilst there are plenty of plain drawstring wash bags that are perfectly functional, they don’t offer much in terms of style. What you may be surprised to learn is that there are actually plenty of stylish wash bags available that are versatile as well as practical. 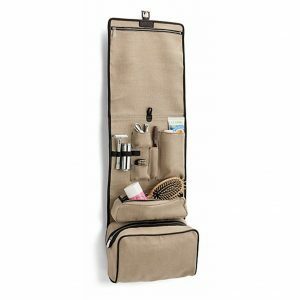 Please read on below to find the best hanging toiletry bag for you. Comes with 7 free leak proof bottles. 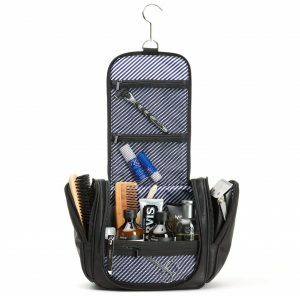 Available in 5 different colours, this mens hanging toiletry bag has a built in smart hook which enables you to hang it on handles, doorknobs and bars and lock it with the attached rubber loop. 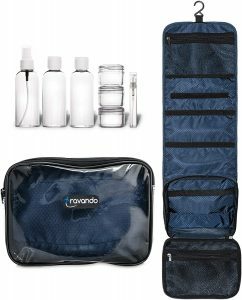 In terms of quality, we were quite impressed with this toiletry bag from Travando. What we particularly liked is the detachable bag and bottle set. 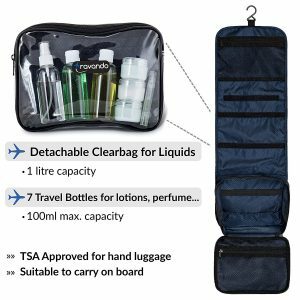 It comes with 7 different leak proof bottles which are perfect for putting your own shampoos and shower gels in if you are unable to buy travel sized bottles. In terms of space saving, this toiletry bag is great. It has 2 mesh pockets, 1 large zipper compartment, plus the detachable clear bag. We really liked the elastic loops on the inside of the bag which help you to keep all of your cosmetics securely in place. Made in Germany, this wash bag is waterproof and has a stylish honeycomb design on the material. Overall, this is a great wash bag, especially given its relatively low price tag, which is why it is number three on our list today. Extra-large so there is plenty of space for all of your toiletries. Stainless steel swivel hook which makes hanging it easy. Could be more dedicated compartments. Next on our list is this large hanging toiletry bag by Höher. What we immediately noticed about this wash bag is the bigger than average size. If you only travel occasionally then this won’t make much of a difference, but i f you are a frequent traveler then you will definitely appreciate the difference. It is made from high quality PU leather and feels really nice to the touch. Something else that we liked about this one is the stylish lining that feels surprisingly thick. You can tell that a lot of thought has gone into the design in order to make sure that this product lasts. The hook is stainless steel which looks stylish but is also really practical; you can easily hang the bag up in your hotel room so that you can easily access the mesh pockets on the inside. Another thing that we liked on the inside is the straps which hold your toiletries in place. We found this especially beneficial for carrying toothbrushes and razors. Overall, this is a really nice wash bag that is fairly inexpensive too. 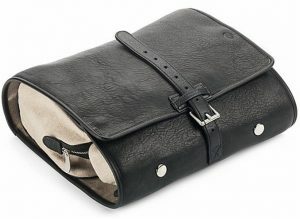 Out of all of the hanging toiletry bags that we tried, the one that we liked the most was this Luxury Mens Hanging Leather Toiletry Travel Bag by Luxury Trex. To start off with, we were really impressed with the look and feel of the Southern German leather that the exterior is made of. The interior is hand-finished using waterproof premium canvas. It not only looks stylish, but feels really high-quality too. On the inside of the travel bag, you will find two zipped compartments of different sizes which we found perfect for storing all of our travel sized toiletries. As well as this, there are 4 different pockets for storing items, as well as elastic hoops which were great for holding razors and toothbrushes. The size of this travel bag is perfect; we were able to store enough toiletries for a week at least. The waterproof inner lining was a really nice extra touch and hanging the travel bag was no problem at all. What made this travel bag stand out for us is the style and elegance that it offers. It definitely had to be number one on our list today. Hopefully you now have a much better idea of the type of hanging travel bag that will be of most benefit to you and our top three choices have given you plenty to think about.